Being fit is a hugely popular topic in our modern society, and every other advertisement on television or online seems to promote weight loss shakes, health supplements, or a brand new exercise routine that is “sure” to change your life. While we don’t necessarily believe in any magic solution to go from inactive to fit, we do believe that healthy eating choices and intentional exercise can make a massive impact on your daily life. Did you know, though, that it could also have a huge effect on your job? While your job might not be the first thing on your mind when you pick up that fruit smoothie for breakfast, or jump on the treadmill for a workout session at the gym, your choice to improve your physical self can do a lot in improving your work life as well. Think: during the day, how often are you uncomfortable, tired, out of breath, or generally unable to keep up? All of these symptoms and more can be due to a lack of physical fitness. For those that work a job based on manual labor, being in shape is even more important, as failing to do so will put unnecessary strain on your joints, your muscles, and your body’s functions. focus on your abs. Abdominal muscles help with lifting, turning, and even sitting. Strong abs mean better posture, and that leads to less back pain during the day, whether sitting for long periods of time at a desk, or standing on your feet working in an active position. weight lifting. While you don’t need to achieve competition level lifting goals, doing moderate weight lifting based off of your individual abilities can help a lot with lifting required materials and doing manual labor at your job each day. 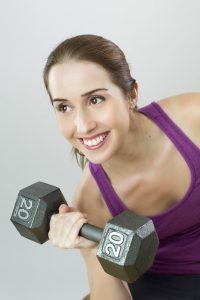 You are much less likely to pull muscles or injure yourself if you are used to weight training. cardiovascular focus. Regardless of your job, it will be made easier when your heart is healthy and operating at its best. Your breathing, your stamina, your energy, and even your focus are all improved with cardiovascular health, so jumping on a treadmill for a job or a bike at the gym is a great place to start when beginning a workout routine. We hope these tips help motivate you to get healthy and get fit this Spring and Summer. Not only will you feel better and your body will thank you, but your boss just might notice too! Still looking for a job meant for you? PHR Staffing Solutions is here to help. We can match you with a job that meets your skills and qualifications, so you can get hired and start working toward a better career while you’re working toward a better YOU.